Kathy Narramore volunteers as a pastor to families in ministry. Kathy provides pastoral care, mentoring, and consultation for Christian workers in the U.S. and for those abroad through VoIP. Her focus is to help people in ministry grow spiritually, emotionally, and relationally, and thus increase their effectiveness and vision. Organization leaders and members consult with Kathy on ways to strengthen their emotional and spiritual support of their missionaries and personnel. You can reach her at kathy.narramore@gmail.com. Kathy was born in China to missionary parents and raised as an MK in SE Asia. She completed graduate studies in higher education, holds a certificate in Biblical Studies from Cru, and is a licensed pastor. 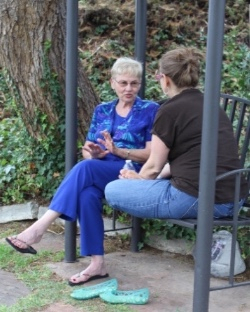 She has over fifty years of experience working with cross-cultural workers and families.